This Astrale diamond white gold necklace from Bulgari features a gorgeous and instantly recognizable iconic design. 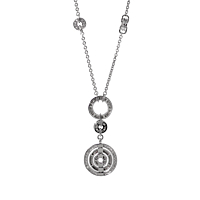 Styled with circles and diamonds, this necklace is finished in 18k white gold. Decadent and beautiful, this necklace includes the iconic BVLGARI inscription that makes it instantly recognizable.